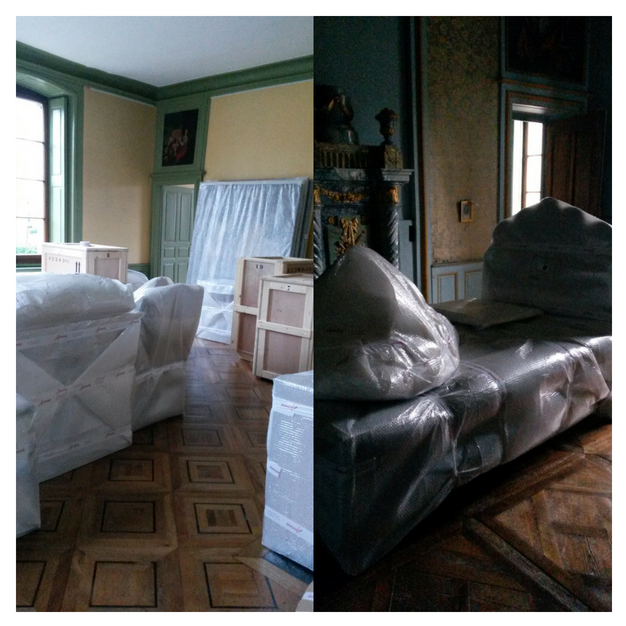 After work on the keeper’s lodge in 2007-2008 and on the orangery and chapel in 2012-2013, a complete restoration campaign was conducted in the château between 2015 and 2018. This work was undertaken on both the interior and exterior of the building. This historic building bears the traces of its successive owners and the changes they made, in particular in the château’s interior arrangements and in the estate’s park. The Centre des monuments nationaux (national centre for monuments and historic buildings) chose to undertake a restoration taking this history, written in the course of the 19th and 20th centuries, into account. This made it possible to avoid any major alteration of the layout and dimensions inherited from these two centuries. In the first place, major work was undertaken on the roofs and façades, in order to restore them and make the building watertight. 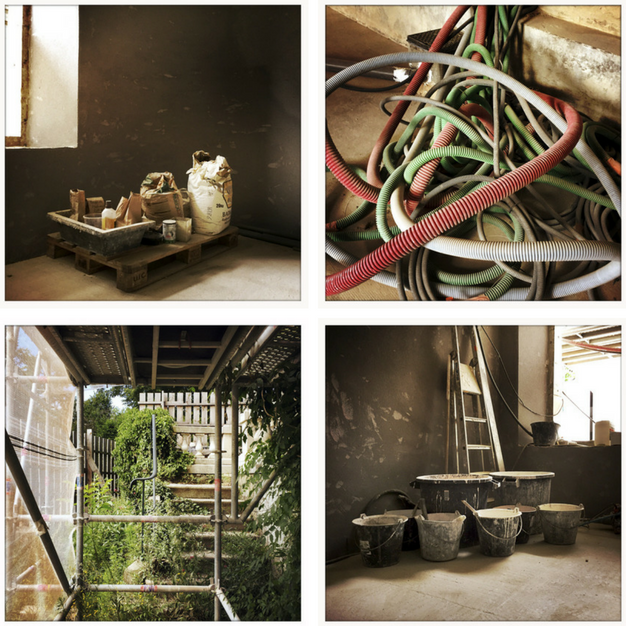 Various kinds of interior work were carried out on the different levels. At the same time, major work was undertaken on the collections. This major work was undertaken for the Centre des monuments nationaux under the direction of François Chatillon, head architect for monuments and historic buildings. The roofs have been restored on the central part of the building and the two wings. This only involved replacing the slates and the lead components, in order to make the roof watertight. Moreover, in order to ensure greater longevity, the zinc components were replaced with tin-plated copper, whose colour was selected in order to be as close as possible to lead. The finials have been restored. The roof structure was also overhauled. In order to enable the work to be carried out on the roofs, a great umbrella was placed over the scaffolding surrounding the château. The carpenters, roofers and stone-cutters were thus able to work in complete safety and sheltered from bad weather. The façades of the château are made with an easily-workable building stone used in Switzerland, known as molasse, which is taken from a very clayey sandstone, and showed a large number of pathologies, in particular major loss of material. The most badly deteriorated parts were replaced or repaired and the facings and coatings were cleaned on the remainder of the façades. 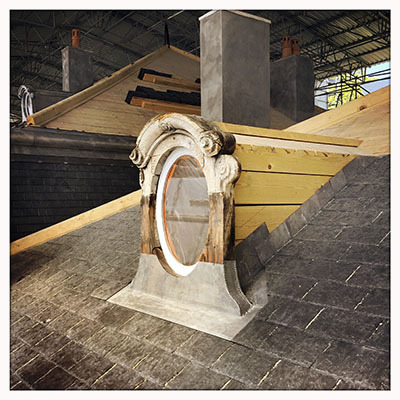 The woodwork (windows, doors, French windows and shutters) was only replaced when its condition did not enable restoration, and all of the work was carried out so as to replicate the original. Two ground floor windows, which had been blocked up, were reopened and their woodwork was designed in accordance with the existing model. The veranda was also restored. Within the framework of the restoration campaign, almost 460 objects (furniture, oil-on-canvas paintings, engravings, pastels works and chandeliers etc.) were placed in storage for restoration work upon the collections. This was in particular the case for two oil-on-canvas paintings, ten gilded wooden frames and fifty-five engravings and pastel works. A study of inventories, accounts and correspondence enabled the elaboration of a programme to enhance the collections, on the basis of historical equivalents. The refurnishing made it possible to complete the Voltairean dimension of the ground floor, in particular on the basis of the various inventories, the scale model and the samples of fabrics gathered together by Catherine the Great and now preserved in Saint Petersburg. The estate account books also provided information on the orders placed for furniture and material life in the château. The collections have been enhanced thanks to objects from the Mobilier national (French national agency responsible for the administration of France's historical tapestry manufactories and furniture collections), the Museum of Fine Arts of Lyon, the Musée de Brou in Bourg-en-Bresse, the Musées des Beaux-Arts of Angers and Nantes, the Institut-Musée Voltaire in Geneva and the Voltaire Foundation at the University of Oxford. The tour takes a look at four different themes. The first sequence is explored in the first three rooms of the circuit. It examines the conditions of Voltaire’s arrival at Ferney, the development of the village at his instigation and life on the Ferney estate. Voltaire’s works and major combats are explored by means of a double audiovisual and multimedia presentation. Visitors also discover part of the master of the house’s art collection, as well as the “Voltaireomania” that emerged during his lifetime. Floorplan - Not for reproduction. All rights reserved. The second sequence enables everybody to experience the pilgrimage to Ferney, as it was after Voltaire’s death. A third sequence enables visitors to enter the world of Madame Denis, thanks to a faithful restoration of her apartments. Finally, in Madame Denis’s maidservants’ room, visitors can appreciate the influence and legacy of Voltaire’s ideas by means of a resolutely contemporary audiovisual presentation. At garden level, the different areas (in bygone days closed to the public) are dedicated to temporary exhibitions and educational workshops. A relaxation area has also been created. Within the framework of the restoration of the château and the redesign of the tour circuit, special attention was paid to members of the public with disabilities. A lift has been installed in a carefully-selected location in order to serve all of the levels of the building in the most suitable manner. The lift shaft is thus set up in a former service passage. This major improvement enables persons with restricted mobility to visit the whole of the historic building. The areas surrounding the château have also been arranged from the entrance in order to make it easier to move around. Finally, adapted educational tools are provided: a tactile model of the château in the 18th century in order to demonstrate the layout and external and interior appearance of the residence (including decorative elements) in Voltaire’s time; a lightly raised-relief map of the estate in the 18th century in order to provide a sense of its surface area, organisation and nearness to the village of Ferney and Geneva; audiovisuals translated into French Sign Language. 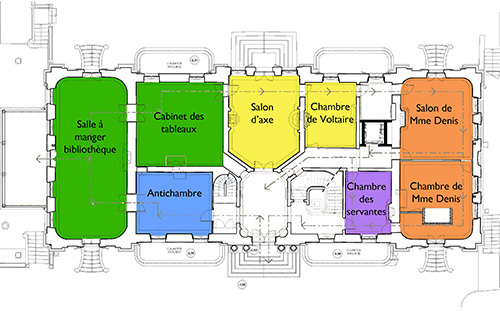 The former apartments of Madame Denis, Voltaire’s niece and the lady of the house, have been restored to their original state, including the rebuilding of the bedroom alcove in particular, thanks to the exceptional material gathered together for Catherine the Great of Russia and still preserved at Saint Petersburg, in particular the floorplan and scale model of the residence, and above all the samples of the textiles. Prelle in Lyon were able to reweave the drawing room and bedroom wall hangings identical to the originals. By means of analysis of the sources provided by inventories, accounts and contemporaries’ comments, these two rooms were refurnished in order to reveal the personality of Madame Denis, who was a key figure at Ferney and alongside Voltaire. The drawing room recalls the distinguished social life of the château and the harpsichord concerts given by Madame Denis. This presence is recalled by the number of seats created by Pierre Nogaret, which have been acquired. The bedroom recalls the search for comfort and intimacy of the Age of Enlightenment. The furniture collections of the Mobilier national (French national agency responsible for the administration of France’s historical tapestry manufactories and furniture collections) have contributed to the success of this project (white painted wooden bed circa 1760, bedside table, settee and armchairs by Pierre Nogaret) completed by objects from the Museum of Fine Arts of Lyon (chest of drawers, seat, small bathroom items and candlesticks). These collections are exact historical equivalents. These two rooms have been refurnished so as to enable visitors to enter the recreated intimacy that Voltaire would have known, made possible by France’s historic items allocation policy.